7 Kids and Us: New Cookies from Voortman Bakery Made with REAL Ingredients! New Cookies from Voortman Bakery Made with REAL Ingredients! Casey and I have been eating Voortman Bakery products for years. She introduced me to them close to 8 years ago when we had the Iced Almonette cookies, and I was hooked! They were so crumbly and delicious, I tried all the other Voortman flavors, and haven't found one I didn't like yet! Now, in a world of fake products (have you seen the cheese? I can't believe stores actually carry something that looks like cheese, but clearly says on the package "not a cheese product" well what is it?) Voortman wants to be the REAL. They are committed to bringing better ingredients to out snack foods. Imagine, a Vanilla Wafer baked with real vanilla. No artificial colors or flavors AND no high-fructose corn syrup! That's what Voortman Bakery is bringing. And of course, my favorite, the Iced Almonette! Check out this ingredient list! Enriched wheat flour, vegetable oil (canola, soybean, modified palm and palm kernel), sugar, ground almonds, salt, corn starch, natural flavours, dried egg white. 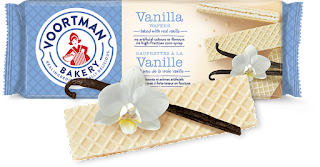 I am so happy that Voortman Bakery products are now being made with real ingredients, they were always delicious, but now I definitely will be buying more!